Hess gas stations may have disappeared, but holiday shoppers can still buy the brand's famous toy trucks. The 2015 truck will be a fire truck and ladder rescue, and will be available for $30.99 on Nov. 1, according to the company. The truck can be found online and in select shopping malls. Hess Corporation sold its retail business to Marathon Petroleum Corp. for $2.6 billion more than a year ago, in order to focus on exploration and production. At the time, the company announced that it would continue selling the toy trucks it has marketed each holiday season since 1964. A different version of the truck is sold each year. Models have included fire engines, helicopters and even a space shuttle. The toy truck has become a collector's item and tradition for some families. 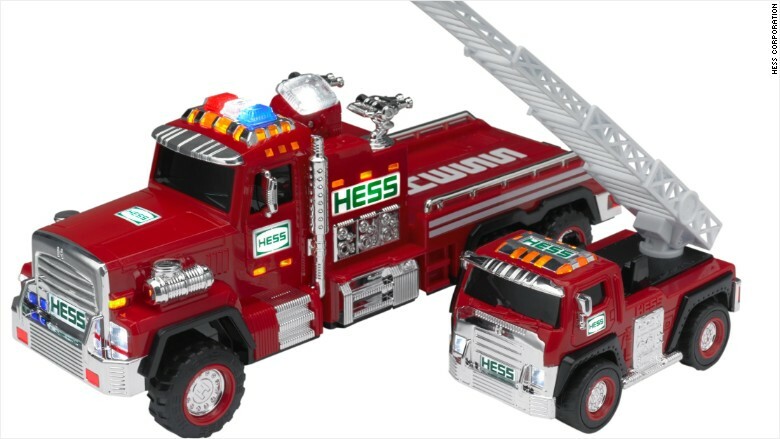 A Hess toy truck float has even been included in the Macy's Thanksgiving Day Parade.